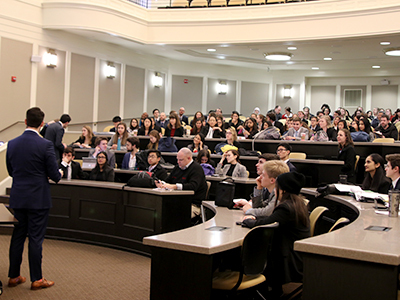 On December 16, 2018, just one day after some Miamians graduated from Miami University, and while most were traveling to or already at home, the James Lewis Family Miami University Mock Trial Program (MMT) welcomed hundreds of Ohio high school students and 20 mock trial teams to Oxford for the 4th Annual Mockhawk Tournament. Miami Mock Trial coach Ben Sandlin prepares to announce the tournament results to the participants. Miami Mock Trial is the reigning National Champion in collegiate mock trial hosted by the American Mock Trial Association (AMTA). MMT boasts 43 All-Americans, 25 consecutive National Championship appearances, 16 top-ten national finishes including a streak for the past 12 years, and two national championships in 2001 and 2018. MMT is comprised of approximately 30 members annually and coached by a staff headed by MMT program director, visiting assistant professor, and Oxford attorney Neal Schuett. "Since its inception, the Mockhawk Tournament has become a mainstay in the Ohio High School Mock Trial circuit," Schuett said. "The teams in attendance represent reigning Ohio State champions, state runner-ups, state qualifiers, and Regional champions." Because the state championship is the highest level of high school mock trial competition possible in Ohio, the field is incredibly competitive. MMT students, coaches, and alumni host the high school students and judge the high school teams' cases in the two-round tournament. The Mockhawk Tournament was created in 2015 by Miami and MMT alumnus and current MMT coach Ben Sandlin, '16. "The Mockhawk is unique, originally and still, because it is the only high school mock trial tournament in Ohio during the fall semester," Sandlin said. "It plays a valuable dual role: to provide a competition to high school students and to provide an opportunity for MMT to give back to the Ohio mock trial community." This year, 20 teams competed, representing a wide geographical area stretching from Cincinnati to Toledo, locally to across the state. 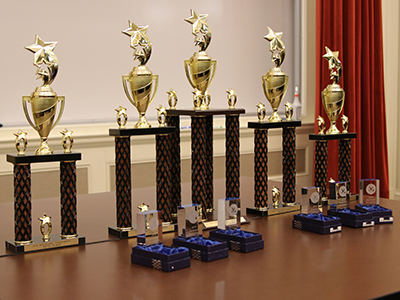 Teams like St. Xavier High School and Reading Community High School, both based in Hamilton County, have competed at the Mockhawk Tournament since 2015. Others, like Ross High School from Butler County, were first-time contenders. Champions were named after two rounds of competitions, and outstanding attorneys and witnesses were recognized for their superior performances. Indian Hill was also the reigning 2017 Mockhawk Champion. Earning an Honorable Mention was a newcomer, Ross High School. "MMT is thankful to the Ohio Center for Law Related Education, or 'OCLRE,' for their continued support of the Mockhawk Tournament and for allowing MMT access to the OCLRE case materials to put on the tournament," Schuett said.